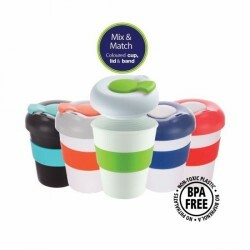 Wide range of Eco cups and reusable takeaway cups and mugs including the very popular Karma Kup range. Keeping it green in your business certainly helps in improving your brand image. 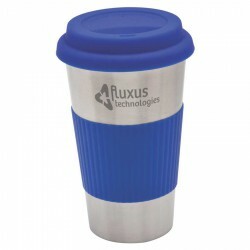 With printed reusable coffee cups, you are sure to promote your corporate eco-friendly advocacy. 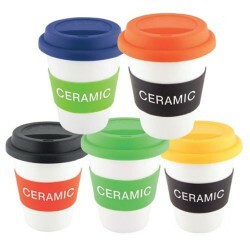 These promotional coffee cups help in the reduction of plastic and paper cup use and allows you to expose your brand 24/7. 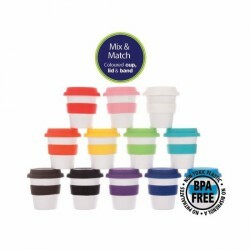 Promotional Product Experts offers a diverse selection of printed reusable coffee cups in different materials including BPA-free plastic, stainless steel and ceramic. 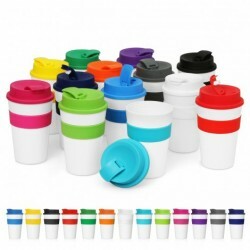 Customers also have several choices in design as well as capacity and we have Karma Kups in 2 sizes. Each promo product can be printed to showcase your business name or logo and even company colours if preferred. Speak with our sales executives for more information. 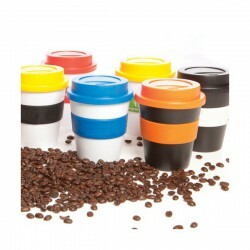 Attention grabbing 500ml colour changing reusable plastic cup. The cup is frosted White and changes colour when ice cold drinks are added. Novelty fun item for events, barbeques and beach parties. NOTE: A production lead time of 10-15 working days, plus shipping, applies to this product as this item is a product directly sourced from overseas. 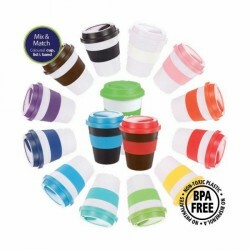 Attention grabbing 650ml colour changing reusable plastic cup. 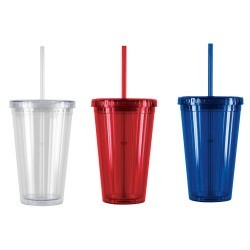 The cup is frosted White and changes colour when ice cold drinks are added. It is a novelty fun item for events, barbeques and beach parties. NOTE: A production lead time of 10-15 working days, plus shipping, applies to this product as this item is a product directly sourced from overseas. 410ml contoured tumbler that is manufactured from Tritan. 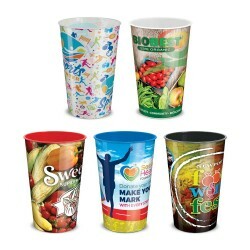 It is an ideal drinkware solution for indoor and outdoor use. Triton is a premium material which is impact resistant, shatter resistant, odour resistant, BPA free and dishwasher safe. 410ml contoured tumbler that is manufactured from PET. 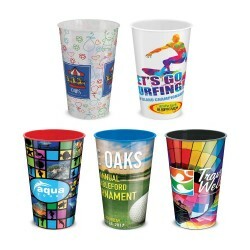 It is an affordable drinkware solution for both indoor and outdoor events. PET is impact resistant, shatter resistant, odour resistant and BPA free but can only be handwashed. 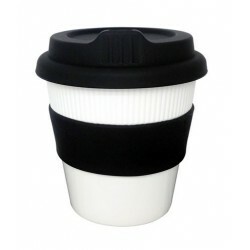 350ml contoured tumbler which can also be used as a wine glass. It is manufactured from Tritan which is ideal for both indoor and outdoor use. Tritan is impact resistant, shatter resistant, odour resistant, BPA free and dishwasher safe. 350ml contoured tumbler which can also be used as a wine glass. It is manufactured from PET and is an affordable drinkware solution for both indoor and outdoor events. PET is impact resistant, shatter resistant, odour resistant and BPA free. It is reusable but can only be hand washed. 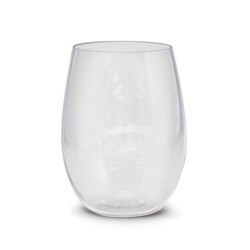 450ml contoured tumbler which can also be used as a wine glass. It is manufactured from Tritan which is ideal for both indoor and outdoor use. Tritan is impact resistant, shatter resistant, odour resistant, BPA free and dishwasher safe. 450ml contoured tumbler which can also be used as a wine glass. 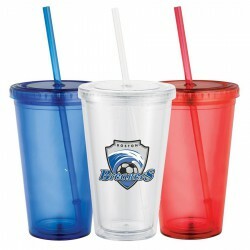 It is manufactured from PET and is an affordable drinkware solution for both indoor and outdoor events. PET is impact resistant, shatter resistant, odour resistant and BPA free. It is reusable but can only be hand washed. 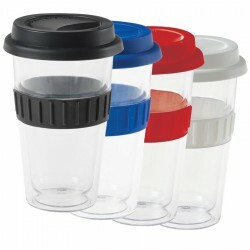 The 300ml double-walled glass Cup2Go provides for excellent return on investment. An everyday item that has the potential to be used ALL day; in the home or office without the lid or in the car with the lid installed, it also provides a clean taste and is an exceptionally hygenic material. Logos can be printed on the silicone band.